Athens is one of the greatest tourist destinations, because it offers many opportunities for any visitor (check the 10 things to do in Athens for first timers here). The heat, however, makes it almost unbearable for anyone to just hang out around the city center all day long. Therefore, it is essential to take a swim at any nearby -or, for that matter, any remote and more secluded- beaches to relieve yourselves of Athens’s summer heat. Searching, however, for a good place to cool yourself in the crystal waters of the Aegean could be difficult, particularly if you have no idea what to keep in mind when heading to the beach. Whether you are with your significant other or with your family, there are many magnificent places to choose from. Depending on what you’re looking for, you can find sandy, gravel or cobblestone beaches, with shallow or deep waters, surrounded by greenery or local shops, cafés and taverns. So, here are the best beaches near Athens that will offer you a safe haven from the sweltering city center, some secluded, others cosmopolitan, but all simply breathtaking. Let’s dive in, then! It is one of the most luxurious beaches near Athens and the most well-known ones, since it is the place where actors, models, TV presenters and other well-known celebrities regularly meet during the hot summer days. The waters here are clear and emerald blue, but entering the beach is a bit expensive, but it is worth one visit. The prices vary depending the season you visit it, but here is a list with all possible expenses, in case you’d like to swim there. During high season (01.05-30.09) the beach operates from 8am to 9 pm during weekdays and weekends, and the entrance fees amount from 20€ up to 75€, if you want to try the VIP experience that it offers. Close to Athens, with shallow and clear waters, this is the ideal beach for anyone who’s looking for an escape from the busy and hot city center of Athens. The beach offers a variety of cafés, restaurants, bars and shops to choose from that almost compels you to stay there all day long, right beside the cool sea. Nevertheless, the beach has an entrance fee, but it is totally worth it, if you really need a way out from the scorching hot weather. Children until the age of 6 enter free of charge. Free parking is also available. Schinias is one of the largest beaches near Athens, yet quite popular during weekends by both locals and tourists, since it is approx. 45 minutes from Athens’s center by car (or by bus). The beach is long and covered by gold and thin sand. The area is not that developed, therefore there are only a few things to do after swimming in the bright blue sea of Schinias. But, let me tell you that, the sea alone is all you need to have a good time and enjoy a nice, cooling bath in Schinias’s waters. Interested in experiencing something new this summer? Join the most original and alternative photo experience in Athens, our "Athens Instagram Photo" tour! Just before reaching Sounio (most probably by car), you will find a beach with thin sand and the most magnificent turquoise waters that can easily remind you of the waters found on any of the islands of the Aegean Sea. Legrena, therefore, is a remote, yet ideal destination for those who search for a more island-like holiday, and all this near Athens. If you don’t plan to visit any of the Aegean islands, then Legrena will give you the chance to have a similar experience by swimming in its clear and splendid waters, without having to leave the mainland. Located between Villia and Alepohori and approx. 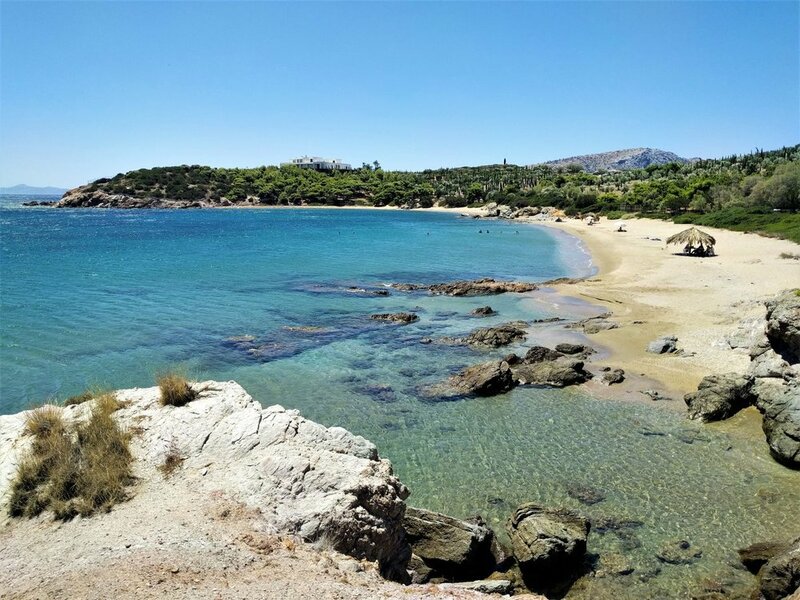 66km from Athens, you can find the beach of Psatha, which offer you more than just a regular swimming experience. If you don’t mind the long trip to get there, the beach offers the opportunity to swim in its magnificent, crystal-clear waters. The beach isn’t organized, so you’ll have to bring your own equipment, especially if the sun is your enemy and you get burnt very easily. 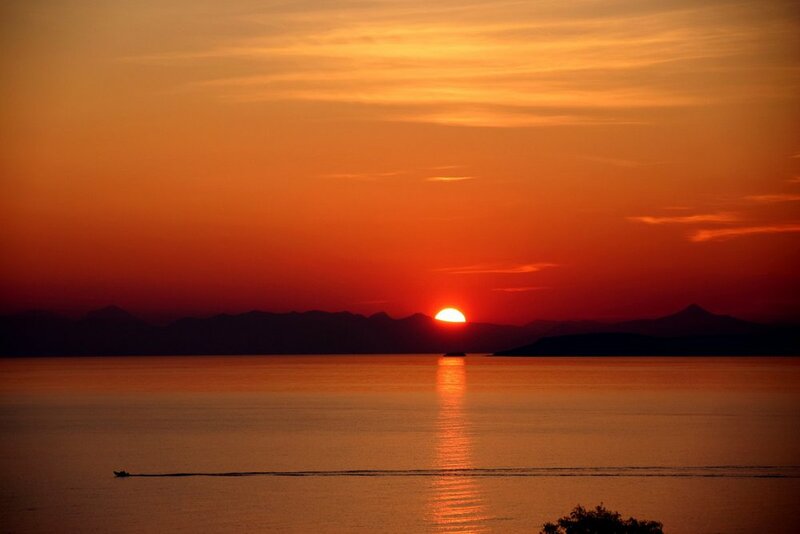 Its unique beauty makes it the perfect place to get away and fully relax by admiring the view of the Corinthian Gulf. Once you’re done enjoying the sea and the sun, you can then head to one of the surrounding fish taverns to drink some ouzo or a cold bear, accompanied by freshly-made mezedes. Hidden from plain sight and known mostly among locals living in the residential area of Pasa in Sounio, you can find the beach of Pasalimani. The sea here is deep, clear and bright blue, while the beach is sandy and of golden brown color. Driving towards Sounio, you turn on the 72nd km Athens-Sounio Rd. and you cross the residential area until you reach the wonderful beach and the uniquely blue sea, where you can kick back on this peaceful beach and swim your everyday troubles away. Explore Sounio and visit the Temple of Poseidon on a Private Tour! Moving to the south, we find a great escape from the overwhelming everyday life of the city center. Located just 44 km from Athens’s center, Kalivia is a beautiful and unique coastal area, offering the opportunity to swim in its blue, clear waters and to relax on its sandy beach with its calming atmosphere. The beach is surrounded by greenery and trees, under the shadow of which you may find the perfect spot to protect yourselves from the blazing sun and the extreme heat during the hottest months of the Greek summer, mainly July and August. The access to the beach is easy by bus or car, and it is ideal for families thanks to its shallow waters. If you get hungry and want to grab a bite, then you should try one of the local taverns and taste delicious local dishes accompanied by a glass of cold beer or ouzo. Would you like to share with us your favorite beach near Athens? Let us know in the comments below!